Soup on a rainy day? I don’t think that’s original at all. But certainly it makes me feel a lot better about the Sun’s absence. I love love love love tomato soup with a grilled cheese sandwich. Reminds me of sick days in middle school. And who doesn’t love chowder? CHOWDER BOWLS!!!!!!! But Vietnamese noodle soups trump all these (not all the time, just right now). 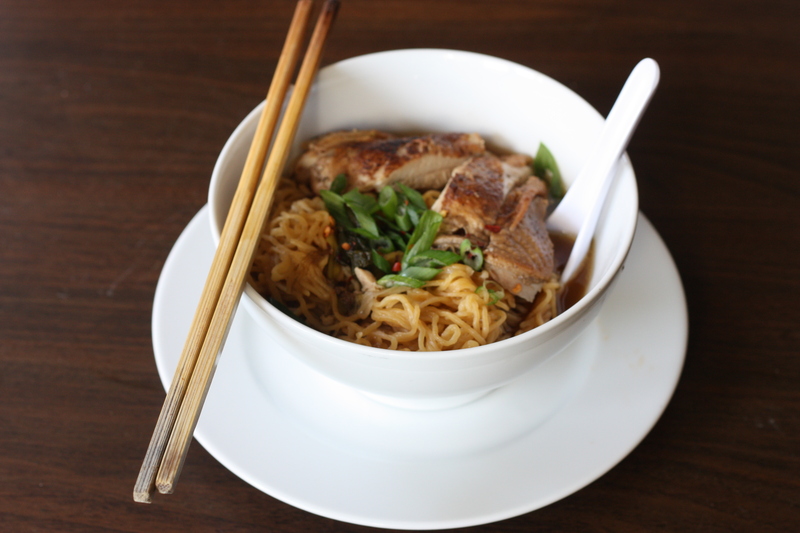 Off the top of my head, I can name 6 noodle soups that are very distinct, all of which are Vietnamese. Of course you got Pho, but there are so much more. 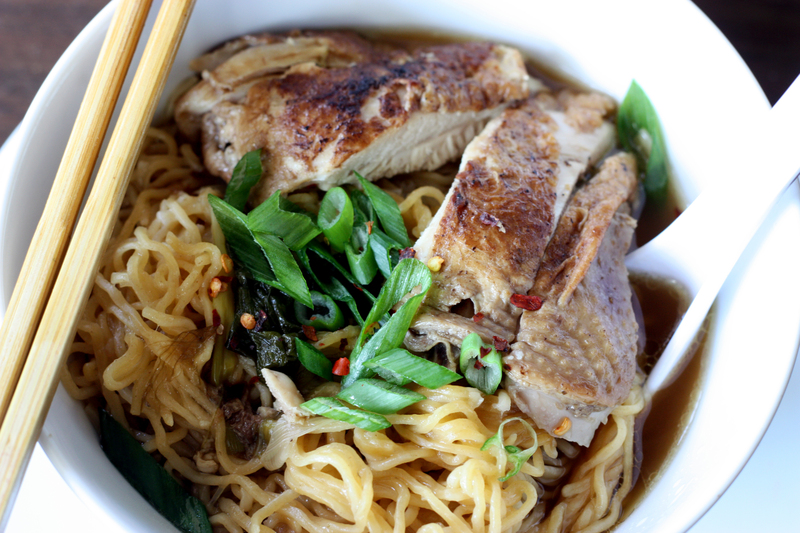 One of my favorites is a duck soup! And I’m pretty sure there is only 2 people in the world who understand how much I love duck. 3 including my mom. This is slightly a Quick Nom. Because I didn’t make the stock from scratch. Forget that, duck is expensive! If you can find duck stock in cubes, that’s all you really need. And some Chinese Egg noodles. And some sort of meat–I used chicken because once again, duck is SO expensive here. And some veggies, I recommend bok choy or Napa Cabbage. Something delicate in taste. Oh and you’ll need green onions. So the idea is, get your stock ready with boiling water, and throw in the white parts of the green onions and let that go. And then in another pot, sear the seasoned chicken on both sides. Transfer the stock into chicken pot, and braise for an hour on a simmer. Then to prepare the noodles, just bring another pot of water to a boil, and boil it for only 3 or 4 minutes, that’s all they need. At the last minute, throw in your veggies. Bowl it with a garnish of green onions, and some red wine vinegar. And there you have it, one of my favorites. Here’s that rainy day they told me about! This entry was posted on March 14, 2012 by rrfoods in Chicken, Dinner, Lunch, Soup and tagged chicken, duck, noodle, soup.